Which? has discovered that some businesses are inflating their prices for weddings, charging more than they would for an equivalent event. The worst offender more than quadrupled the price for room hire. Which? contacted venues, DJs and photographers in Edinburgh, London and Manchester. We asked for quotes for a family reunion party and a wedding. The events were on the same day, at the same time of year and with an identical number of people attending. We found that some businesses jack up the price as soon as they learn it’s a wedding. To avoid being overcharged and find out how to keep your ceremony and reception costs down, visit our guide to cutting wedding costs. 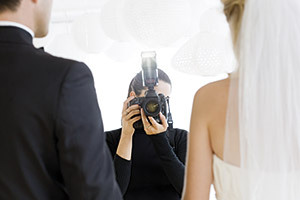 Every photographer we contacted quoted a higher price for a wedding than a private party. We managed to talk one down to £320 for a family reunion but the same photographer insisted that £450 was the lowest price for a wedding. The four DJs we spoke to also wanted to charge more for a wedding. One DJ based in Edinburgh quoted £300 to £350 for a wedding compared with £200 to £250 for a family party. The most shocking price increase we came across was from a venue that inflated the amount it wanted to charge for a wedding by a staggering £650. When we told the venue we had 100 wedding guests, we were quoted £850 to hire a room with a minimum capacity of 120. But when we phoned back and enquired about a family party for 100, we were offered a different room for £200, unprompted.